What is Frontline Spot On for 23-44 lbs? 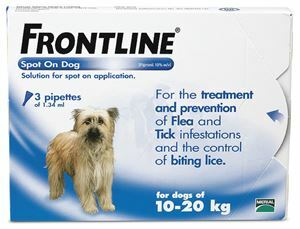 Frontline Spot On is an innovative and effective method for killing Fleas and Ticks and also control biting lice on your pets. This fast acting formula kills fleas and ticks within 48 hours after application. Frontline Spot On for Medium Dogs has effect after application for upto 2 months. Frontline Spot on for Medium Dog is a topical application that kills almost 100% fleas in your dog within 24 hours. It stops infestation by breaking the life cycle of fleas. This cost effective treatment is water proof and long lasting. As instructed by the vet or as mentioned on the insert. Although rare, some signs of irritation, redness or itching may show. If the symptoms persist, it is advisable to seek your vets advise. Frontline Spot On for Medium Dog should be stored at a cool and dry place and away from the reach of children.